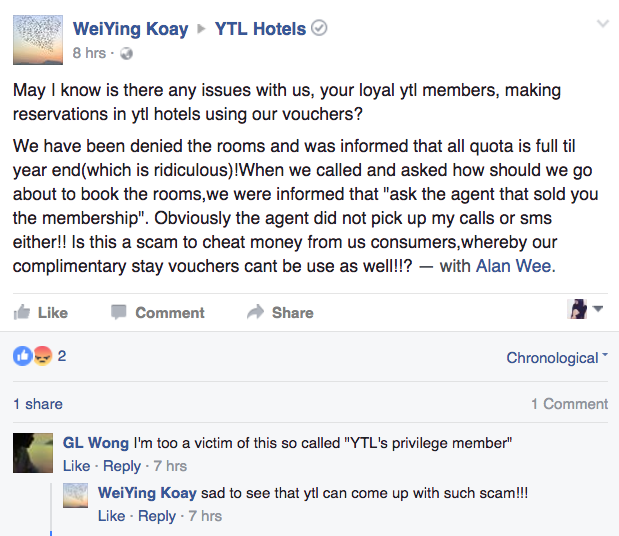 are you a victim of the YTL scam? 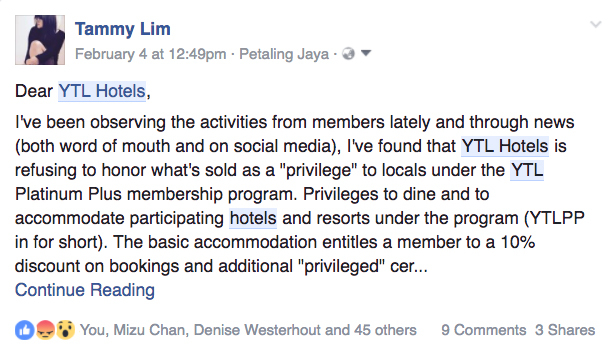 The YTL membership scam is now a subject on social media with more members noticing the pattern in their failure to utilise their membership privileges to book a hotel under YTL's big conglomeration of hotels such as JW Marriot Kuala Lumpur, Ritz-Carlton Kuala Lumpur, The Majestic Malacca, Vistana Hotel, Cameron Highlands Resort, Pangkor Laut Resort, Tanjong Jara Resort, Gaya Island Resort, Spa Village Resort and The Green Leaf Niseko Village (Japan). The membership is a yearly membership program called the YTL Platinum Plus which entitles its members to dining, accommodation, spa and retail privileges. Upon signing and payment of the said membership, a membership card and three booklets containing one-time use only certificates are given. As a member, one can enjoy up to 20% off discounts at participating hotels under YTL. 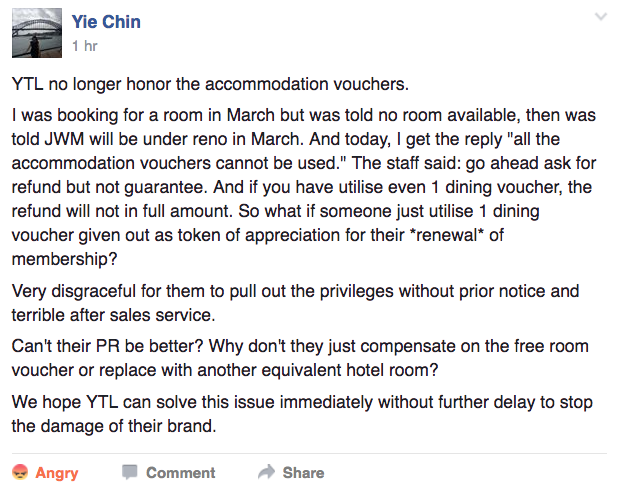 However, YTL Hotels is refusing to honor these privileges to unsuspecting members who tried to utilize them. The reasons can range from "we're under renovation" "It is fully allocated (for the entire year)" or bluntly "all accommodation privileges cannot be used this year" (when pressed). 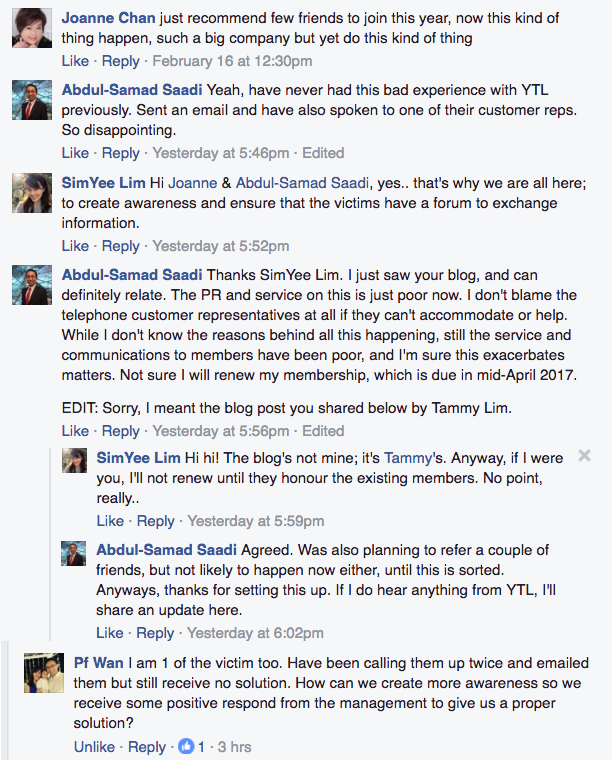 Suspicions arose as members complained on YTL Hotel's Facebook and realized something was amiss. 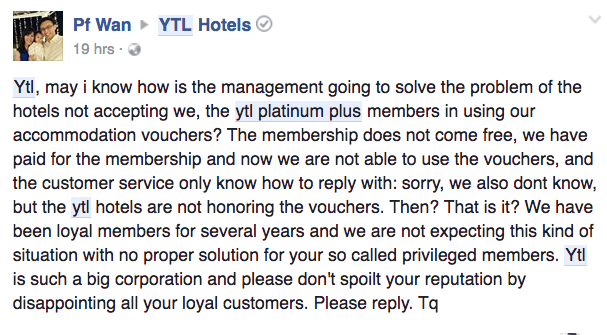 No satisfactory explanation is given to members other than "we're sorting this out" and by pushing the blame to one another between YTL Platinum Plus and YTL Hotels. 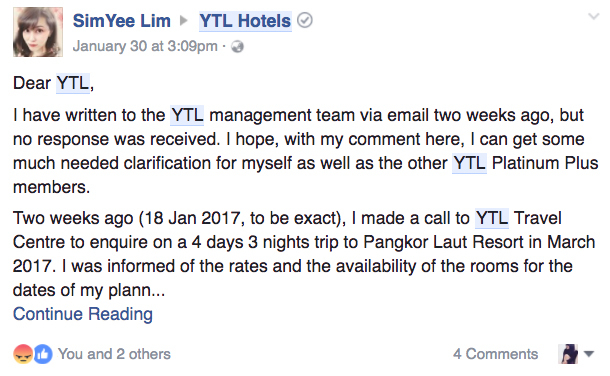 YTL Hotels, a respected name in the hotel industry has shown it's true colors by sweeping the complaints under the carpet. 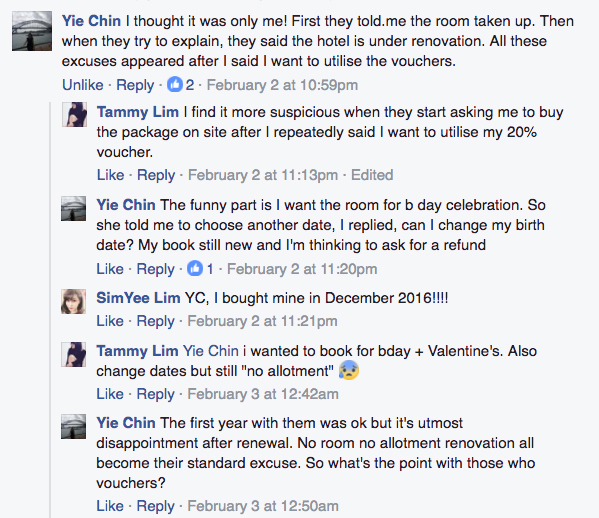 Instead of taking control of the issue, YTL Hotels has chosen to hide all public posts from their Facebook while celebrating the launch of their new hotel, Hotel Stripes. At the same time, they continue to post beautiful photographs of their hotels and resorts, attracting their fans to come book a memorable stay, which cannot be enjoyed by their members. 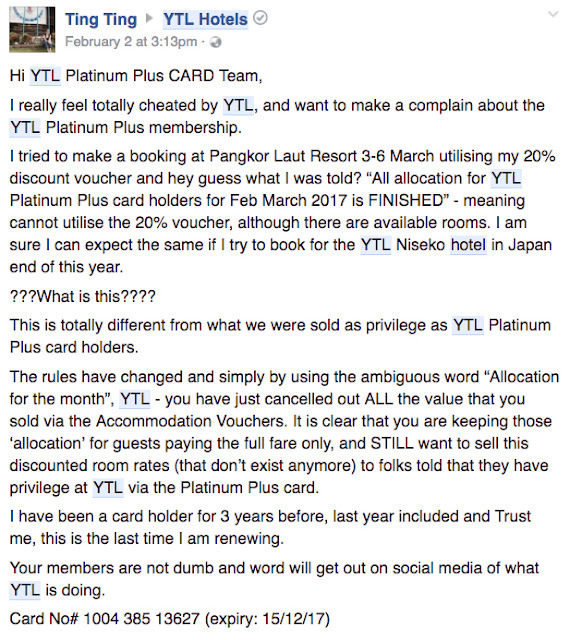 YTL Platinum Plus's employees have cut off all communications as well with their members by refusing to reply to their emails and or accept telephone calls. While other members lucky enough to contact them were given the runaround. 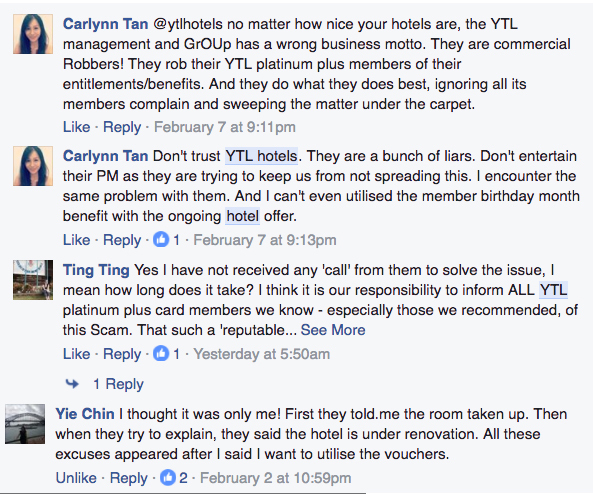 Members raising the red flag "YTL SCAM" and their complaints has fallen on deaf ears. 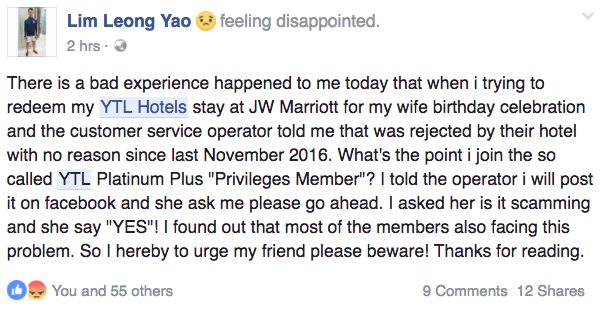 Who knew a trusted name in the hotel industry would have such a notorious reputation. Victims or those experiencing the same, may join the ongoing conversations on Facebook here which have nearly 100 members and counting. One of the saddest experience was removed to protect the privacy of the member. I hope Mrs.M gets her refund. Do you need a huge capital to start off your business proposal or expansion? Have you lost hope and you think there is no way out, and your financial burdens still persists?